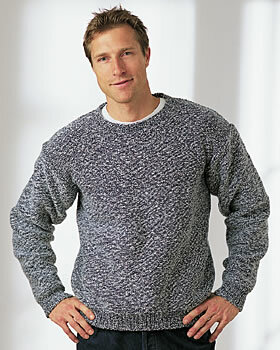 Men of all ages will love this cozy knit sweater from Bernat Yarns. This easy knitting pattern makes a great gift for dads and grandpas, and is a great wardrobe accessory for the fall and winter months. Sizes are given for small through XXL, so you'll be able to make a knit sweater for all the men in your life. Make a few in all his favorite colors so he can show off your handiwork. Gauge: 18 sts and 24 rows = 4 ins 10 cm with larger needles in stocking st. The instructions are written for smallest size. If changes are necessary for larger sizes, the instructions will be written thus ( ). **With smaller needles, cast on 95 (99-103-115-125) sts. ***1st row: *K1. P1. Rep from * to last st. K1. 2nd row: *P1. K1. Rep from * to last st. P1. Change to larger needles and proceed in stocking st** until work from beg measures 27 (27½-28- 29-30) ins [68.5 (70-71-73.5-76) cm], ending with a purl row. Cast off 30 (32-33- 38-43) sts beg next 2 rows. Leave rem 35 (35-37-39-39) sts on a st holder. Cont even until work from beg measures 24 (24½-24½-25- 25½) ins [61 (62-62-63.5-65) cm], ending with a purl row. Next row: K38 (40-42-48-53) (neck edge). Turn. Leave rem sts on a spare needle. Dec 1 st at neck edge on next 4 rows, then every follow alt row to 30 (32-33-38-43) sts. Cont even until work measures same length as Back to shoulder ending with a purl row. Cast off. With RS of work facing slip next 19 sts from spare needle onto a st holder. Join yarn to rem sts and work as given for left side reversing shaping. With smaller needles, cast on 43 (49-49-51-51) sts. Rep from *** to *** as given for Back. Change to larger needles and proceed in stocking st inc 1 st each end of needle on next and following 4th rows to 73 (77-93-97-101) sts, then every 6th row to 81 (85- 95-99-103) sts. Cont even until work from beg measures 17½ (18-18½-18½-19) ins [44.5 (45.5-47-47-48) cm], ending with a purl row. Cast off. Neckband: Sew right shoulder seam. With RS of work facing and smaller needles, pick up and knit 18 (19-20-22-24) sts down left front neck edge. K19 from front st holder. Pick up and knit 18 (19-20- 22-24) sts up right front neck edge. K35 (35-37-39-39) from back st holder, dec 1 st at center. 89 (91-95-101-105) sts. Work 1½ ins [4 cm] of (K1. P1) ribbing as given for Back. Cast off loosely. Sew left shoulder and neckband seam. Sew right shoulder seam. With RS of work facing and smaller needles, pick up and knit 18 (19-20-22-24) sts down left front neck edge. K19 from front st holder. Pick up and knit 18 (19-20- 22-24) sts up right front neck edge. K35 (35-37-39-39) from back st holder, dec 1 st at center. 89 (91-95-101-105) sts. Place markers on sides of Front and Back 9 (9½-10½-11-11½) ins [23 (24-26.5-28-29) cm] down from shoulders. Sew sleeves between markers. Sew side and sleeve seams. I'm stuck at the sleeve increasee for it to measure 18.5" (large). With all the above comments it doesn't make sense. After you cast off the 38 sts on the next 2 rows, you are leaving the remaining stitches on a holder. You'll be using them later for the construction on the sweater. I know this is really late, maybe it will help someone else. It would be nice if this pattern was updated with clearer instructions. For a first time sweater this is challenging to novices to understand. this is my first sweater...I am on shoulders and I don't understand the part about the second row?? I know how to cast off ..so for exlarge I cast off about 38 stitches and then what???? For the sweater for your man, what does the *****'s mean? I don't see instructions for those *'s?. the asterisks in a pattern denote which parts of the pattern to repeat. so , when it saids repeat from **-** as for back, you do exactly that, got back to the back pattern and find the ** and start there and continue to where the next ** are. For those of you that were having trouble with the sleeves of the sweater. When you get to the 6th row increase your stitches by increasing 8 more stitches to that row. If you look at the sleeve instructions before the parenthesis the 4th row increases to 73 sts and then the 6th row increases to 81 sts. Therefore it make sense to increase by 8 sts for the larger pattern.